I’ve spent an inordinate time over the past year or so talking to companies that are playing in this cloud management space – from enStratus to RightScale to traditional vendors like BMC it’s a really promising space. So I wanted to reflect on the OpenStack Dashboard announcement in light of that. 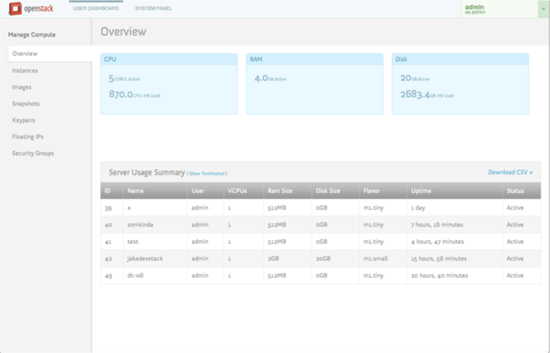 Make no mistake, OpenStack having a control dashboard is very different from Amazon Web Services having one. With AWS the dashboard is very much a tool to manage geographically spread clouds from one vendor. That’s important but doesn’t really answer the call going forwards which is the control of discrete clouds from multiple vendors in multiple regions. This is where enStratus in particular is spending a huge amount of time, wrapping sophisticated business rules around the management of cloud assets from a bunch of different vendors. Which got me thinking about OpenStack dashboard. If OpenStack will eventually succeed in having many different vendors build products on top of the OpenStack platform, then surely Having an OpenStack dashboard largely obviates the need of products like those from enStratus and RightScale – if you can have multiple resources from multiple vendors in multiple geographies on one Dashboard (which comes as part of the core OpenSource offering) why would you pay for a third party solution? I wanted to dive into this a little and so spoke to George Reese, founder of enStratus and someone who is deeply interested in the cloud management space. I put it to Reese that the OpenStack dashboard reduces the need for his product. At first he was a little dismissive of the risk, pointing out that enStratus is much more than a dashboard product but rather an allover management tool. He also pointed out that, as yet, we haven’t seen any public cloud built on top of OpenStack and that when people want to manage disparate clouds they generally want to include both public and private resources. I need to point out that enStratus has never been just a simple dashboard on top of cloud services, their value proposition lies in wrapping a lot of process and policy around cloud management. But he went on to point out that where enStratus is really placing its bet is on the advanced cloud governance and automation that a simple control dashboard is unlikely to cover, at least in the short term. Reese also mentioned that one of the big barriers for OpenStack lies in how hard it is to get an OpenStack cloud up and running, a graphical user interface stuck on top of the OpenStack offering will do little to address that problem Reese contends. What this means for companies currently playing, and looking in the future to play in the cloud management space, is that you need to look significantly up the value chain. Simply providing a front end to cloud services is a strategy fraught with risks and threats, rather an approach that sees high level management that can be wrapped around specific business rules and policies for an organization is a safer bet going forwards. Management is a broad discipline that spans fault, configuration, accounting, performance and security. OpenStack’s dashboard scratches the surface of some of these but doesn’t have the depth of function one expects in a true systems management platform. I think the cloud world is safe for the management vendors for a while longer.